Secondary progressive multiple sclerosis (SPMS) is characterized by progressive accumulation of disability without intermittent recovery. Treatment of these patients is challenging due to limited understanding of pathogenesis and fewer therapeutic options. This article summarizes difficulties in defining and conducting trials in SPMS, review major clinical trials on therapies approved and unapproved in SPMS and lastly, therapies in pipeline for use in SPMS. 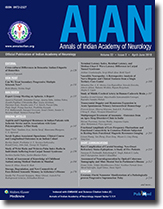 A multidisciplinary team of experts took stock of the current state of affairs about many aspects of aphasia in India, including community burden, diagnostic assessment, therapy, rehabilitation, research, education, and advocacy. The broad spectrum of aphasiology was matched by the types of participants ranging from neurologists, speech-language pathologists, clinical psychologists, linguists, to experts in neuroimaging and computer sciences. Threadbare discussion in 16 sessions over 3 days leads to the identification of pressing problems and possible solutions. Many action plans have been envisaged and recommendations made. A few examples with high priority are community-based and hospital-based study incidence and prevalence of aphasia, development of test batteries for the assessment of many components of speech and communication in Indian languages which are validated on rigorous psychometric, and linguistic criteria, national registry for aphasia, educational modules about aphasia for different target groups, resources for advocacy and its training, a bank of research questions and outlines of research protocols for young professionals to pursue. The expert group will continue to oversee execution of some of the actionable plans in short and long term. Introduction: Antiplatelet resistance is one of the urgent issues in current stroke care. One-third to one-half of the patients who experience a recurrent stroke is already on antiplatelet medications. We studied resistance to aspirin and clopidogrel in Indian stroke patients and its association with gene polymorphisms. Methods: Platelet function testing by light transmission aggregometry was performed on 65 patients with ischemic stroke who were stable on dual antiplatelet therapy (clopidogrel 75 mg OD and aspirin 75 mg OD) along with 65 age-matched controls. Aspirin resistance was considered as mean platelet aggregation ≥70% with 10 μM adenosine diphosphate (ADP) and ≥20% with 0.75 mM arachidonic acid. Clopidogrel resistance was defined as <10% decrease from the baseline in platelet aggregation in response to ADP 10 μM and semi-response as <30% decrease from the baseline. Polymorphisms CYP2C19 * 2 and GPIIb/IIIa (PLA1/A2) were genotyped by polymerase chain reaction-restriction fragment length polymorphism. Results: We found 64.6% (42/65) patients with inadequate response to clopidogrel (15.4% [10/65] resistant and 49.2% [32/65] semi-responders) and 4.6% (3/65) patients with inadequate response to aspirin (3.1% [2/65] resistant and 1.5% [1/65] semi-responder). The frequency of CYP2C19*2 mutant genotype was significantly higher in clopidogrel nonresponders compared to responders (P = 0.014). Clopidogrel nonresponsiveness was much higher in small vessel stroke. Conclusion: Unlike aspirin, a high proportion of nonresponders to clopidogrel was identified. In an interim analysis on 65 Indian patients, a significant association was found between CYP2C19*2 and clopidogrel nonresponsiveness. Context: Opsoclonus, a rare neurological manifestation in scrub typhus, causes significant distress and disability. There is a paucity of clinical data and outcomes in these patients. Aim: This study aims to describe the clinical and laboratory profile and longitudinal outcomes in a scrub typhus patient cohort with opsoclonus. Settings and Design: This retrospective study was conducted in a 2700-bed teaching hospital in South India, in scrub typhus patients with opsoclonus over a 5-year period. Patients and Methods: Clinical, laboratory, and radiological data and outcomes at discharge and 6- and 12-weeks postdischarge were documented. Results: Of 1650 scrub typhus patients, 18 had opsoclonus. 17 had opsoclonus at presentation, while one patient developed opsoclonus on the 5th admission day, 1-day postdefervescence. 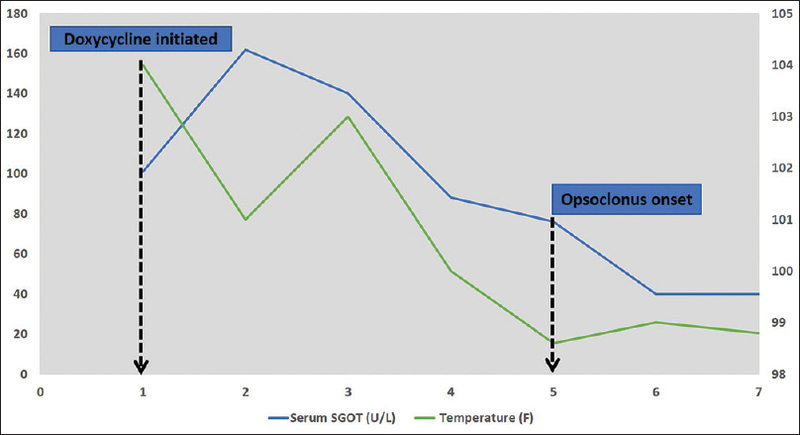 Opsoclonus was first noted after a median interval of 11 (7–18) days from fever onset. 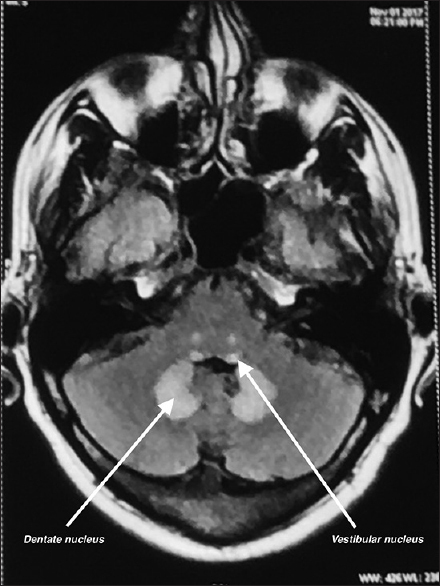 It was associated with myoclonus in 94% (17/18), cerebellar dysfunction in 67% (12/18), extrapyramidal syndrome (EPS) in 33% (6/18), and aseptic meningitis in 17% (3/18) patients. Mean cerebrospinal fluid (CSF) white blood cell (WBC) count was 9 ± 2.7 cells/cumm, with mean CSF protein 118.5 ± 53.9 mg% and mean CSF glucose 97 ± 13 mg% in 1l/15 patients. 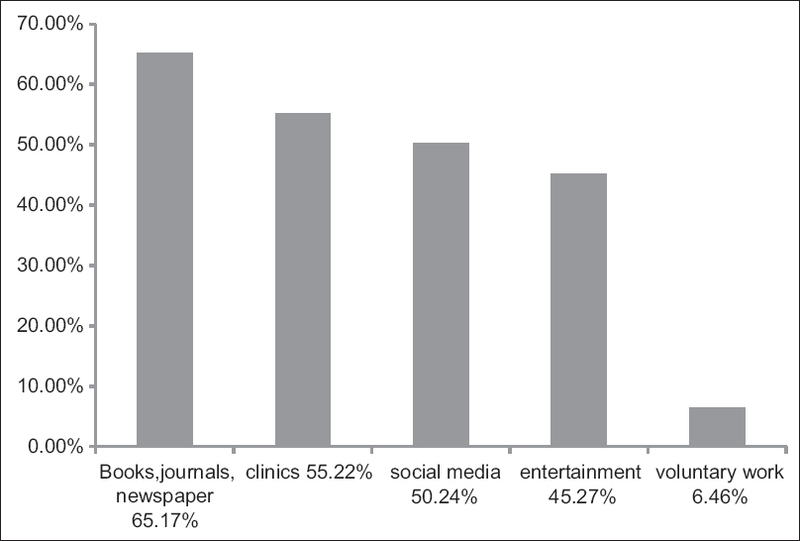 Brain magnetic resonance imaging was unremarkable in 75% (9/12). Case-fatality rate was 5.5% (1/18). 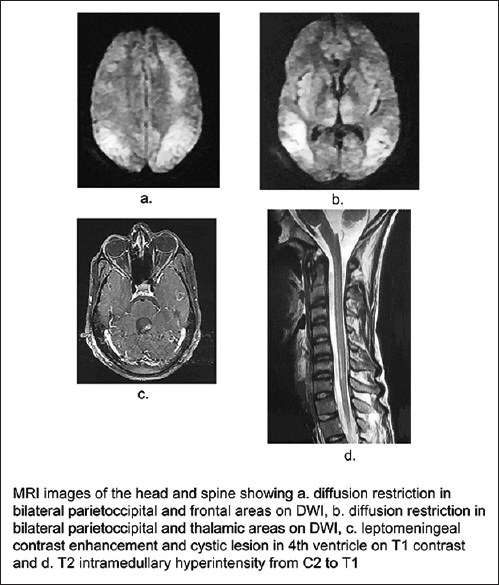 Complete resolution of the index neurological syndrome occurred at 12-week postdischarge. Conclusions: Opsoclonus is a rare neurological manifestation in scrub typhus, usually occurring in association with myoclonus, cerebellar dysfunction, or EPS. It appears to occur during the resolving febrile phase, with neurological deficits completely resolving at 12 weeks. Background: Carpal tunnel syndrome (CTS) is the commonest median nerve entrapment neuropathy, with preponderance in females. Aims and Objective: The aim of the present study was to find out wrist ratio (WR) and wrist/palm ratio (WPR) in clinically diagnosed patients of CTS. 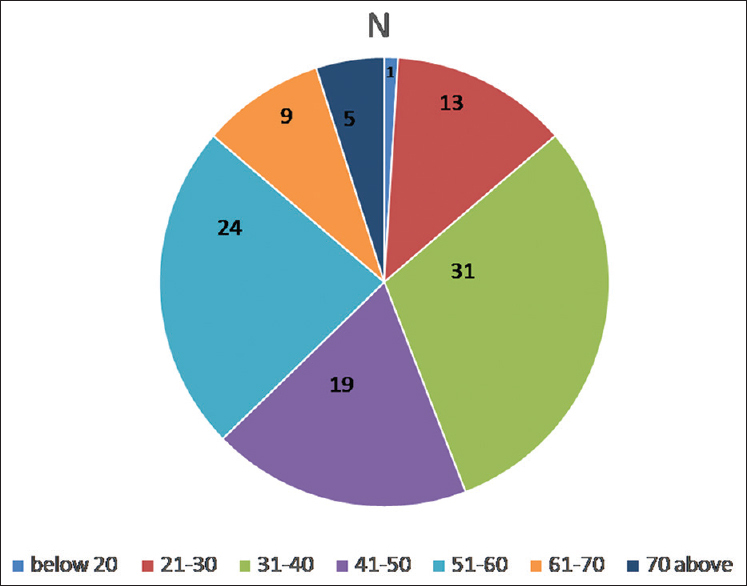 Methodology: One hundred individuals (fifty patients of CTS and fifty as control group) aged between 30 and 50 years were recruited for the study. Early confirmation of clinically suspected patients of CTS was done by performing electrodiagnostic tests of median and ulnar nerves. Motor and sensory conduction velocities, distal motor and sensory latencies, and F-wave latencies were performed in the recruited volunteers. Results: The values for mean wrist ratio in control groups were 0.694, 0.703 respectively, and in patients with carpal tunnel syndrome, it was 0.704 and 0.719 respectively in moderate and severe type. The mean wrist to palm ratio (WPR) in control group was 0.371, while in patients with CTS, it was 0.374, 0.382, 0.387, and 0.401 based on progression of severity. Both were statistically significant for the last two groups (wrist to index finger [WIF] >4.4 m/s, moderate, and WIF nonrecordable, severe). Statistically significant (P < 0.001) decrease of motor conduction velocities for median nerve was seen in the CTS group as compared to control group. Statistically significant (P < 0.001) increase in distal motor and sensory latencies was observed for both median and ulnar nerves in CTS group with more increase in distal motor latency than sensory latency. Increase in F-wave latencies of both nerves was seen in CTS group. Conclusion: The study results confirm selective slowing of sensory and motor conduction within wrist-to-palm segment in patients of CTS. Both WR and WPR have a progressive correlation with the severity of CTS, but statistically significant changes were seen in the groups with moderate and severe CTS. Thus, WR/WPR can act as one of the essential parameters in the diagnosis of CTS with moderate-to-severe CTS. Aims: This study is to study the knowledge and awareness on autism among medical students and the factors which impact their knowledge on autism. Settings and Design: For the study, a multicenter cross-sectional research has been carried out among medical students in seven medical colleges in Mumbai. Subjects and Methods: A total of 201 final-year medical students from seven medical colleges in Mumbai completed the knowledge on childhood autism among healthcare workers (KCAHW) survey and a semi-structured pro forma. Of the 201 students, 152 are from the public medical colleges and 37 from the private medical colleges. Statistical Analysis Used: Data collected have been represented in the form of frequency and percentage. SPSS 20.0 is used to analyze the mean distribution of KCAHW scores. A value of P < 0.05 is regarded as statistically significant. Results: The total mean score in the KCAHW questionnaire is 11.85 ± 3.15 out of 19. This is considered as poor knowledge. Our study reveals that students' knowledge on autism is limited. Knowledge gaps identified in certain autism spectrum disorder (ASD) symptoms are associated with the obsessive and compulsive repetitive pattern of behavior and that autism is associated with epilepsies. Conclusions: It is thus important that these children displaying ASD symptoms are diagnosed correctly and at the earliest. To enable this, doctors in all fields must be able to accurately identify the diagnostic features of autism both within and outside the four walls of the hospital. Background: Excepting amnesia, impairment of other domains also hampers the activity of daily living in Alzheimer's disease (AD). Although prosopagnosia poses problem in interacting with other persons, it rarely causes problem during interaction with close relatives as known voice acts as cue for recognition. Objective: In a cohort of AD, we planned to study errors in recognition, naming, and assigning relationship of close relatives, to assess the type and frequency of errors and to explain with current knowledge and hypothesis. Materials and Methods: This cross-sectional study was conducted in Memory Clinic of Medical College Hospital, Kolkata, India, between July 2013 and June 2015. Patients were evaluated by history, general neurological examination, and neuropsychological tests. A structured questionnaire was used to assess recognition (use of honorifics) and naming defect of close relatives. Results: AD was diagnosed in 42 patients. Prosopagnosia was found in 14 and anomia in 6 patients. Four patients exhibited problem during conversation with close relatives. They assigned name and relation of one generation earlier to close relatives with proper recognitions. Discussion: We got predictive error of name and relation assignment of close relatives by one generation back with normal recognition. 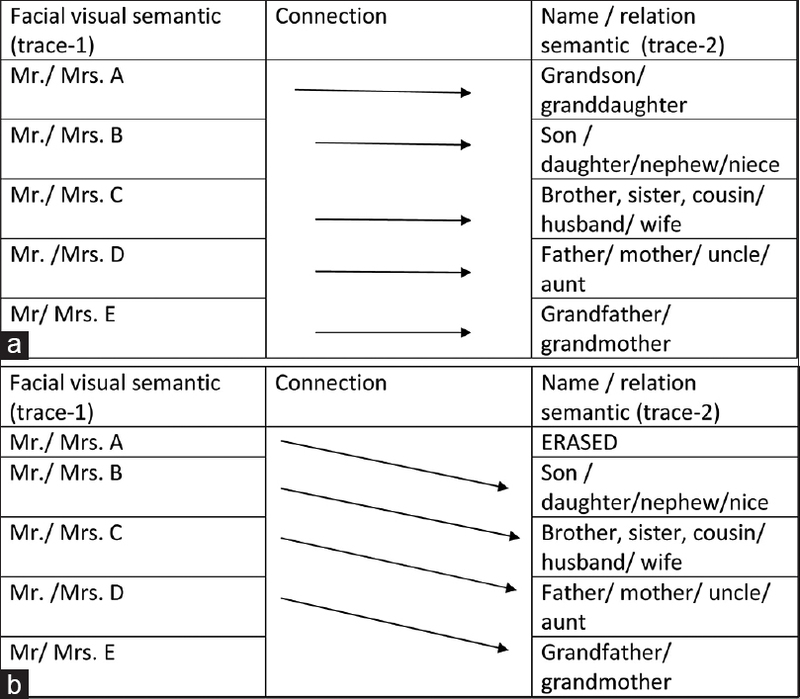 It can be explained by two memory traces in connection of face-visual and name (with/without relation) representation, earlier being hierarchically older and more resistant to wearing. Conclusions: We hypothesize that the name/relation store is orderly conserved. In AD, after degradation of part of name/relation store, a new wiring might be built up between these two traces. Introduction: Carpal tunnel syndrome (CTS) is the most common entrapment neuropathy, but no electrodiagnostic test alone shows sufficient sensitivity for CTS. We aimed to investigate the value of median motor terminal latency index (mTLI), median motor residual latency (mRL), and median-ulnar F-wave latency difference (FdifMU) as additional tests to nerve conduction studies which are performed traditionally in electromyography laboratories. Methods: This is a retrospective study. The results of electrodiagnostic studies performed on patients with CTS were examined. 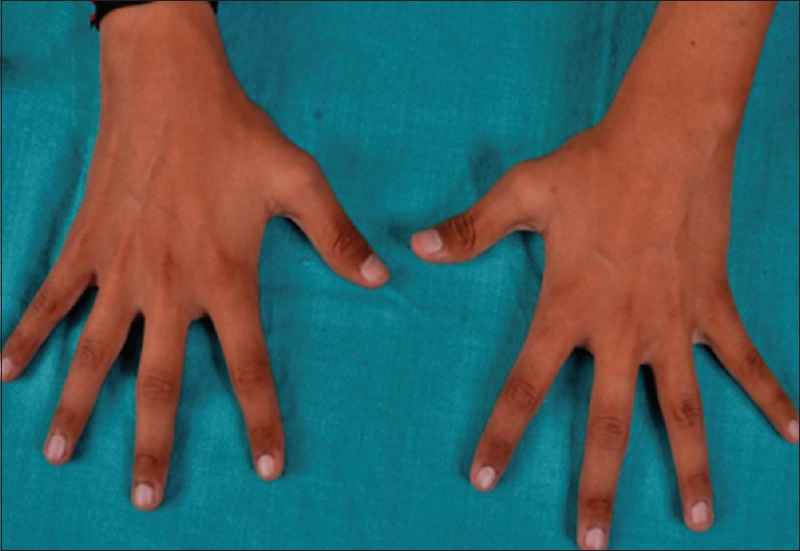 We divided the enrolled hands of the patients diagnosed with CTS into two groups: affected hands with abnormal electroneuromyographic parameters indicating CTS diagnosis (CTS group) and hands with normal electroneuromyographic parameters (control group). Then, we analyzed the results of these completed electrodiagnostic studies. Results: A total of 320 hands of 160 patients were studied. 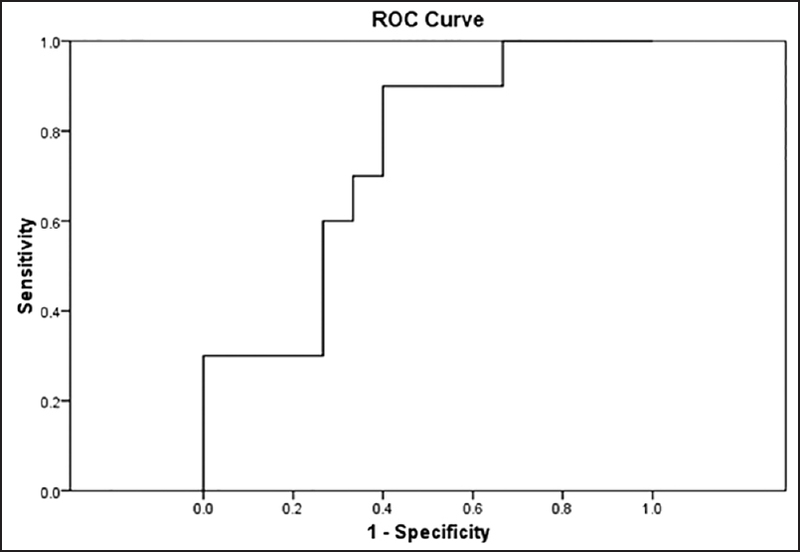 FdifMU and mRL were found to be significantly higher in CTS group compared with the control group (P < 0.001). mTLIs were found to be significantly higher in control group compared with the CTS group (P < 0.001). Given that, the area under the curve is more than 70% for mTLI and mRL, but not for FdifMU. Conclusion: When combined with mMDL, both mTLI and mRL have excellent specificity for the diagnosis of mild and moderate CTS. However, the sensitivities for both parameters were lower. In suspected patients, FdifMU can be an additional tool for the diagnosis of CTS also, but alone it is not valuable. Objective: Vasculitic neuropathy can be either restricted to the peripheral nerves or associated with systemic involvement of other organs. The objective of this study was to analyze the nerve biopsies reported as “vasculitic neuropathy” with clinical features. 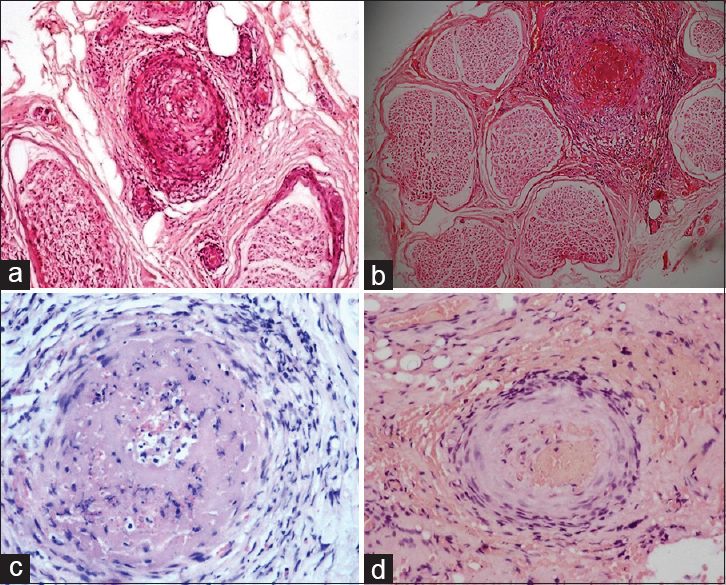 Materials and Methods: All cases diagnosed with vasculitic neuropathy were retrospectively analyzed and categorized as systemic vasculitis and nonsystemic vasculitic neuropathy based on the clinical features. The histological features were further evaluated and classified according to the Peripheral Nerve Society Guidelines. Results: Of the 126 cases, there were 65 nonsystemic vasculitis, 45 secondary systemic vasculitis, and 16 primary systemic vasculitis. Definite vasculitis was more common in the systemic vasculitis group. The epineurial vessels were predominantly involved with chronic axonal changes. Conclusion: The sensitivity of definite vasculitis on nerve biopsy was 54.76%. The sensitivity increases when the diagnostic criteria of definite and probable vasculitis were applied taking into account perivascular inflammation accompanied by vascular changes and axonopathy. Background: Middle cerebral artery (MCA) is the larger terminal branch of the internal carotid artery. It travels through the Sylvian fissure on the insula. Objective: MCA supplies a large area of distribution than the other two cerebral arteries. Though it is so, there are very few articles in the literature describing MCA. Aim of the present work is to study the MCA regarding its origin, course, termination, branching pattern, morphometry and symmetry. Materials and Methods: 340 MCAs from 170 formalin preserved brains were dissected. Morphology, morphometry and symmetry of MCAs, were studied in detail and well photographed. The data collected in the study was analyzed. Results: Accessory MCA was found in seven specimens (2.05%). Duplicated MCA was seen in three specimens (0.88%). Aneurysm was found in three specimens (0.88%). MCA with bifurcated, trifurcated, quadrifurcated and single trunk termination was seen in 220 (64.70%), 42 (12.35%), 8 (2.35%), and in 70 (20.58%) specimens respectively. Bifurcated pattern as upper prominent trunk (type A), lower prominent trunk (type B) and both equal prominent trunks (type C) were seen in 63 (28.63%), 129 (58.63%), and 28 (12.72%) specimens respectively. Asymmetry was seen in 102 specimens (60%). Mean length and diameter of the MCA was 25.5-27.8 mm and 3 mm respectively. 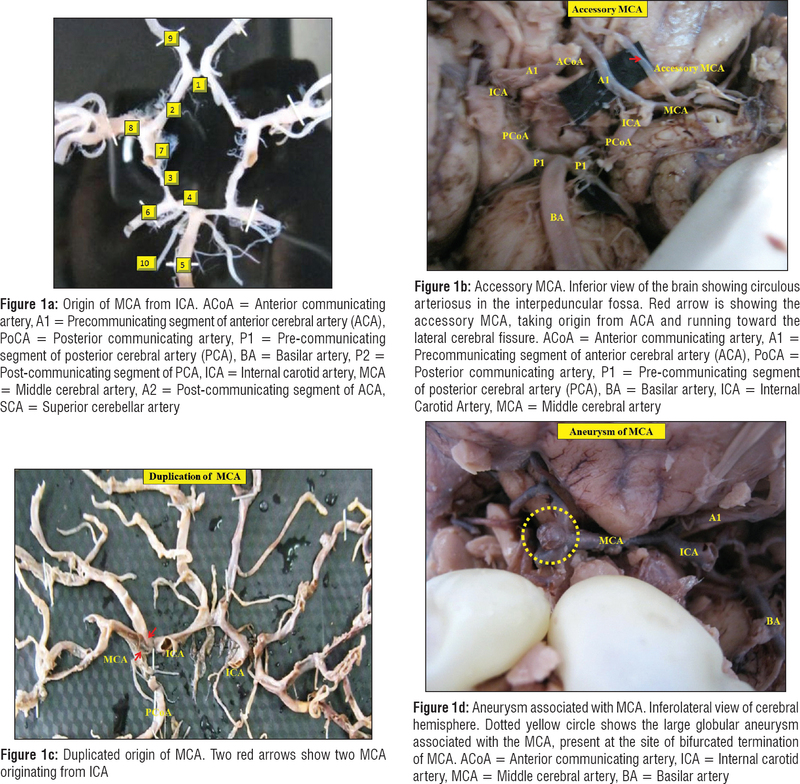 Conclusion: Awareness of these anatomical variations in branching patterns is important in neurovascular procedures. As very few Anatomical studies on MCA are there in the literature, this type of research work should be done by a number of scientists from a different region of the world in large scale. Context: The data on the role of Transcranial Doppler (TCD) in the management of acute primary intracerebral hemorrhage (ICH) is meager. Aims: To study TCD variables associated with hematoma expansion in acute primary ICH. Settings and Design: The study was carried out in the neurosciences department of Post Graduate Institute of Medical Education and Research (PGIMER), Chandigarh from July 2010 to September 2011 employing a prospective, double blinded non randomized study design. Materials and Methods: Acute ICH patients within 24 h of symptom onset were recruited. Baseline neuroimaging study (Computerized tomography, CT scan of brain) was performed to assess the pure hematoma volume by AXBXC/2 method. Baseline TCD parameters were obtained from both the middle cerebral arteries (MCAs; affected and unaffected hemisphere): Peak Systolic velocity, End Diastolic velocity, Mean Flow velocity, Resistance Index, and Pulsatility Index. Follow up (24 h) assessment of hematoma volume and TCD were carried out. Each of the TCD variables were compared in hematoma expansion (>33% increase in hematoma volume on the follow-up CT) and non-expansion group. Statistical analysis: On univariate analysis, the Student's t-test and contingency tables with the X2 test were used. A forward stepwise multivariate logistic regression analysis with hematoma expansion at 24 h as the dependent variable and ROC analysis was carried out, using SPSS software version 16 (Chicago, IL). P value < 0.05 was considered significant. Results: Twenty-five patients completed the study. Ten patients (40%) had hematoma expansion. Multivariate analysis revealed unaffected hemisphere MCA Pulsatility Index ratio [unaffected hemisphere MCA Follow up Pulsatility Index/baseline Pulsatility Index] of > 1.055 as the lone correlate of hematoma expansion (sensitivity of 90% and specificity of 60%). Conclusion: Frequent assessment with TCD could aid in prediction of hematoma expansion by measuring unaffected hemisphere Pulsatility Index ratios. Introduction: A large proportion of the population suffers from disturbed sleep and a majority of these present to clinicians with the complaint of insomnia. Many of these people possibly suffer from other primary sleep disorders such as sleep apnea; however, insomnia disorder also remains an extremely common condition directly impacting the quality of life and work efficiency of affected people. While a number of approaches are used for treatment by many clinicians, a much smaller percentage can seek help from specialty sleep clinics. Since very little data are available regarding the effectiveness of treatment offered, this retrospective study aims at examining the outcome of chronic insomnia patients attending to a quaternary care specialty sleep center. Methods: Consecutive patients with the presenting complaint of and diagnosis of insomnia, during a study period of 2 years between 2013 and 2015, were identified and analyzed. Patients were classified based on the comorbidity and types of treatment received. Life stressors were also identified and analyzed. Outcomes were reviewed for those who had follow-up data available. Results: Based on the defined inclusion criteria, 102 patients could be analyzed. Among these, at least 3-month follow-up was available for 48 patients. It was observed that among patients for whom at least 3-month follow-up was available, 91.4% (43/48) showed a good response to treatment with physician-administered cognitive behavioral therapy for insomnia along with treatment for comorbid conditions. Conclusion: With correct diagnostic classification, as well as appropriate and easily available treatment strategies, excellent treatment outcomes are observed at specialty sleep clinics. 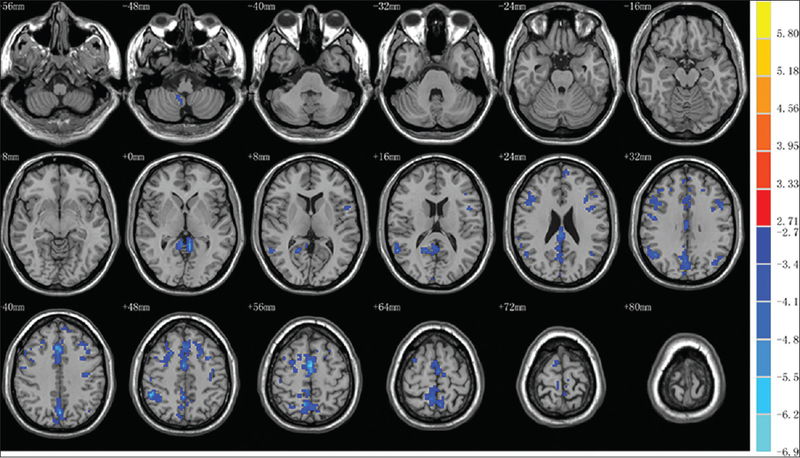 Objective: The objective of the study is to investigate the changes of fractional amplitude of low-frequency fluctuations (fALFFs) and functional connectivity (FC) in the brain function of comatose patients with resting-state blood-oxygenation-level-dependent functional magnetic resonance imaging (BOLD-fMRI) and to discuss the underlying neurophysiological mechanism of disease. Materials and Methods: Resting-state BOLD-fMRI scans were conducted on 20 comatose patients and 20 age-matched and gender-matched controls. The differences of fALFF between two groups were analyzed with two-sample t-test; significant differences of connectivity between groups were acquired to calculate the FC of the precuneus with other brain regions. Results: Compared to the control group, the comatose patients exhibited a significant reduction in fALFF in various areas, including the right cingulate gyrus, left precuneus, right inferior parietal lobule, right superior parietal lobule, bilateral anterior/posterior central gyrus, middle frontal gyrus, right superior frontal gyrus, right superior temporal gyrus, and the bilateral cerebellar hemispheres (P < 0.05, Alphasim correction). Compared with controls, the brain region FC correlated with the precuneus reduced mainly located in the bilateral inferior parietal lobule, posterior central gyrus, lenticular nucleus, left anterior central gyrus, left medial frontal gyrus, left anterior lobe of the cerebellum, right insula, right transverse temporal gyri, and right thalamus. Regions whose FC increased include the left superior frontal gyrus, left side of the callosum, left superior parietal lobule, and both sides of the cingulate (P < 0.05, Alphasim correction). Conclusion: Measurements of fALFF and FC obtained by resting-state BOLD-fMRI could provide considerable information for the analysis and evaluation of the brain function of comatose patients from the perspective of local function and global functional network and provide the theoretical basis for the study of coma nerve physiological mechanism. Introduction: New-onset refractory status epilepticus (NORSE) is uncommon and almost 50% of cases are cryptogenic. We report the rare development of NORSE following carotid artery stenting (CAS), a procedure which is increasingly being used to treat the carotid stenosis. Materials and Methods: Patients who developed NORSE following CAS for the prevention of stroke over a period of 5 years were analyzed retrospectively. The degree of internal carotid artery stenosis (ICA) was estimated as per the NASCET criteria. Results: We analyzed five patients (age: 56–83 years). NORSE was reported within 30 min to 14 days post-CAS. Status epilepticus was focal in two patients, generalized in two, and one had nonconvulsive status epilepticus. All patients were treated with multiple antiepileptic drugs. Four patients recovered and survived and one succumbed. Two patients had comorbid hypertension and two had diabetes and hypertension. Four patients had hemiparesis due to the contralateral middle cerebral artery territory infarction and one patient had syncope. Two patients had postinfarction gliosis. Conclusions: We report a new cause of NORSE, following CAS. Stroke resulting in gliosis and cerebral hyperperfusion syndrome are the proposed mechanisms. Background: Parkinson's disease is a neurodegenerative disease. Cognitive disorders and retinal degeneration may occur during the early stages of the disease. Retinal degeneration and cognitive findings can be assessed easily with optical coherence tomography and mini–mental test, respectively. Materials and Methods: Twenty-two patients who are being followed-up with Parkinson's disease and 22 healthy controls have been included in the study. The Unified Parkinson's Disease Rating Scale (UPDRS) and Hoehn–Yahr staging of the patients have been conducted at the time of admission. Retinal nerve fiber layer analysis and ganglion cell thickness (ganglion cell complexes [GCCs]) were evaluated through optical coherence tomography (OCT). And at the same time, we aimed to compare the stage of the disease, the UPDRS score and the duration of the disease with OCT and cognitive functions by mini–mental test. Results: Mini–mental test total score value (P = 0.025) and language value (P = 0.021) were lower in the patient group compared to the control group. In patients, there is a reverse significant correlation between UPDRS-T and GCC-left-superior (r = −0.495; P = 0.026), GCC-left-inferior (r = −0.517; P = 0.019), and GCC-left-to (r = −0.508; P = 0.022). There is a significant parallel relation between recall and RFNL-right-mean (r = 0.626; P = 0.039). Conclusion: Our findings indicate that the neurodegeneration continues multisystemically and neurodegeneration increases simultaneously with the disease. OCT, which is a noninvasive method, can be used as an indicator of neurodegeneration in patients with Parkinson's disease. Deep cerebral venous thrombosis (DCVT) remains a very rare entity among the spectrum of cerebral venous thrombosis (CVT). Due to the bilateral draining territories, DCVT nearly invariably causes bilateral infarction with predictably dismal prognosis. 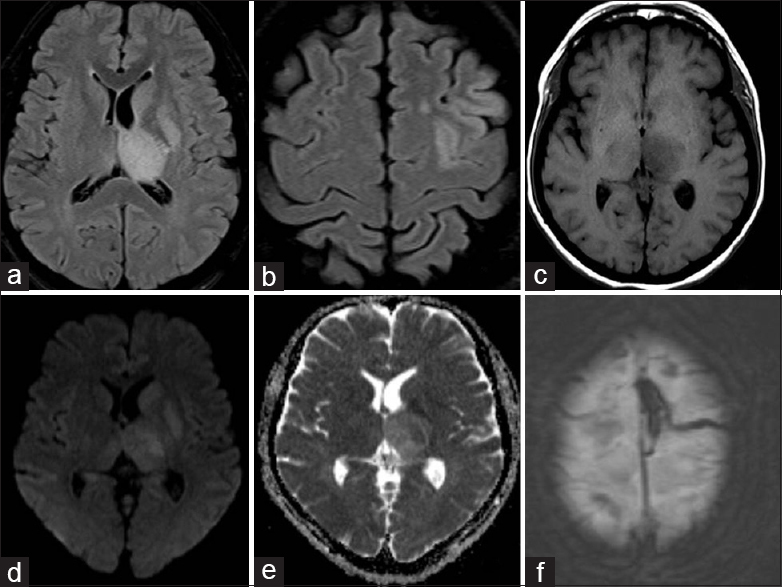 However, rare instances of DCVT with unilateral infarction having favorable prognosis have been described, but pose a wide range of differentials to the clinician and require careful interpretation of clinical and radiological features for accurate diagnosis. Here, we report two unusual cases of DCVT with unilateral thalamic infarction with excellent outcome. We also report a rare case of CVT, with simultaneous deep and cortical vein thrombosis. Through a relevant review of the literature, we also examine the clinical presentations of unilateral infarction due to DCVT and their outcomes. Creutzfeldt–Jakob disease (CJD) belongs to a group of prion disease that is caused by abnormally folded proteins and is clinically characterized by rapidly progressive cognitive decline, gait abnormalities, and myoclonus. Familial CJD is very rare and is described only in few families around the world. 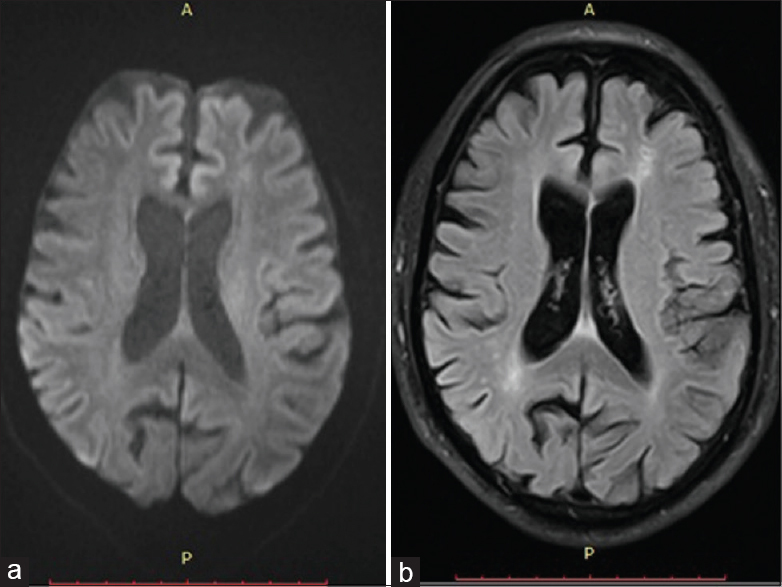 We report a case with rapidly progressive cognitive decline, ataxia, and myoclonus, with a history of several members of his family developing similar symptoms and succumbing to it. 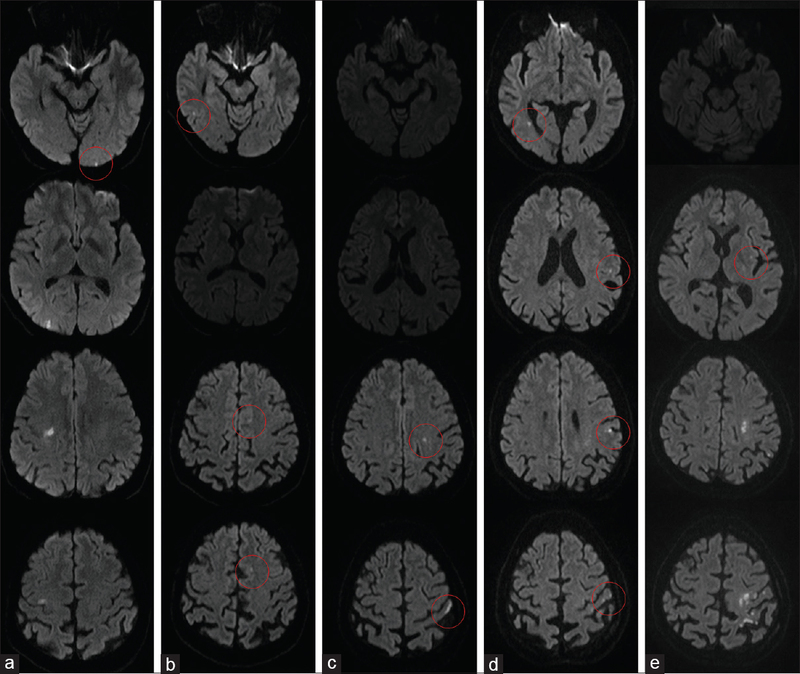 Clinical presentation and neuroimaging were suggestive of CJD. On genetic analysis, our index case and two of his family members (younger brother and younger son) were found to have D178N mutation in PRNP gene. The polymorphism of the 129th amino acid was V/V. 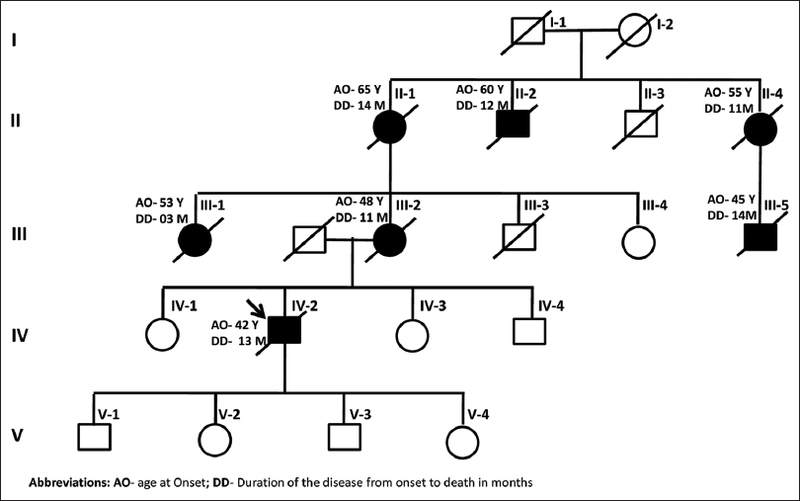 We report the first kindred familial CJD from South-East Asia with genetically proven D178N-129V haplotype. Mitochondrial dysfunction plays an important role in the pathogenesis of Parkinson's disease. Primary genetic abnormalities in the mitochondrial DNA or nuclear DNA can cause parkinsonism. Mitochondrial parkinsonism presents with classical features of parkinsonism along with multisystem involvement. Genetic analysis is essential in reaching the diagnosis which is not always possible, especially in developing countries. Muscle biopsy can be a boon in this setting as exemplified in our report of two siblings where a diagnosis of mitochondrial parkinsonism was made on the basis of muscle biopsy. We describe an 11-month-old boy who presented with recurrent respiratory infections from 6 months of age. His elder sister died at 10 months with severe septicemia and meningitis. The boy had a mild motor delay. Investigations revealed T cell deficiency and very low serum uric acid suggestive of purine nucleoside phosphorylase (PNP) deficiency – a rare variant of severe combined immunodeficiency disease. 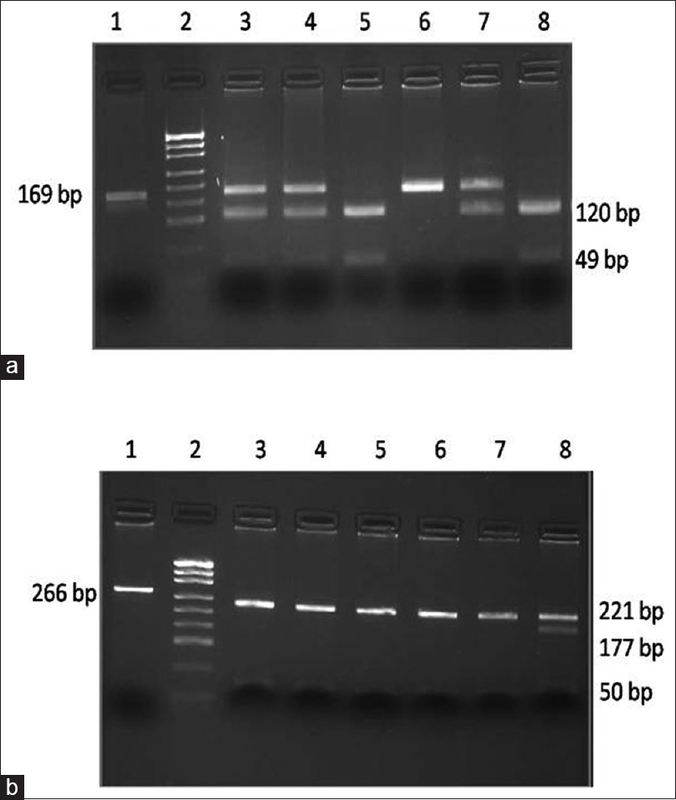 A novel homozygous missense mutation of c.597C>G(p. S199R) of exon 5 on PNP gene confirmed the diagnosis. We suggest that uric acid should be a part of investigation profile for unidentified motor delay, as recurrent infections can be late presentation. Strongyloides stercoralis (SS) is one of the most overlooked helminthic infections despite being highly endemic in tropical and subtropical areas. In immunocompromised patients, especially those on long-term steroids, infection can often escalate to fatal dissemination into major organs. 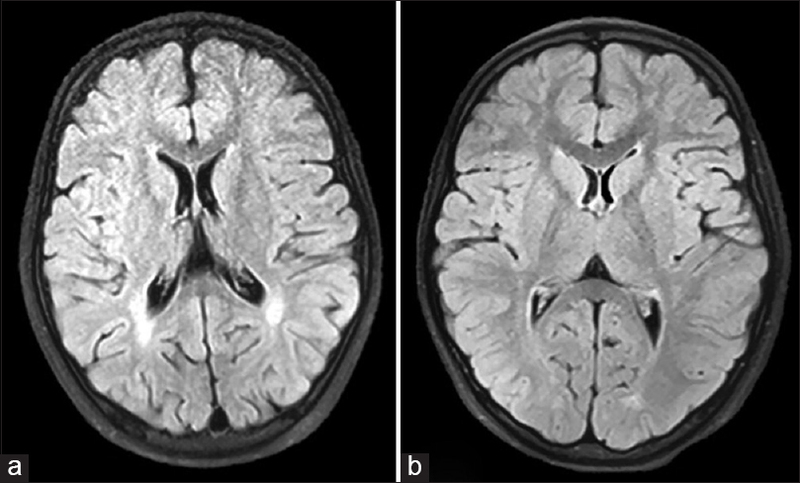 We present a compendium of two immunocompromised patients, who were on high-dose steroids and presented with worsening neurological status. Cerebrospinal fluid analysis was notable for larvae of SS as diagnosed by direct visualization. A syndrome of SS hyperinfection with dissemination was made after stool, and sputum samples also revealed SS larvae. SS is an elusive disease and should be considered early on, especially in endemic regions like India. Early diagnosis and prompt initiation of antihelminthic therapy is indispensable for favorable outcomes. Scrub typhus, a mite-borne zoonotic disease, is endemic in several parts of India. It may cause multisystemic disease involving lungs, heart, spleen, liver, hematological system, and nervous system. Neurological involvement may include meningoencephalitis, cerebellitis, cranial nerve palsies, plexopathy, transverse myelitis, muscle dysfunction, neuroleptic malignant syndrome, parkinsonian syndrome, and Guillain–Barre syndrome. 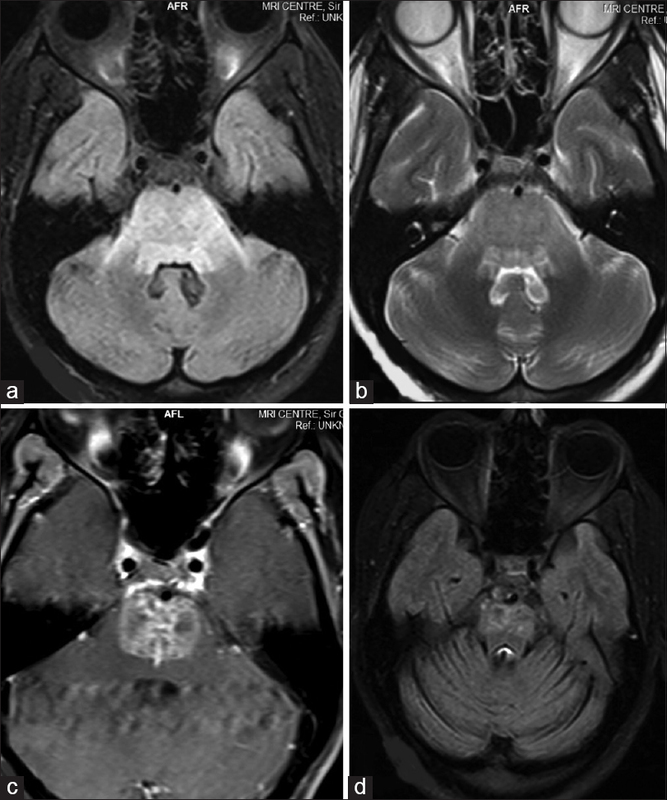 Here, we report a rare patient of scrub typhus, who developed meningoencephalitis followed by long-segment myelitis and axonal polyneuropathy, with hepatic, renal, hematological, and pulmonary involvement, following acute febrile illness with associated neurocysticercosis. He gained consciousness with a resolution of almost all of his complaints, with the exception of muscular power, which showed partial improvement following treatment with doxycycline, azithromycin, and steroids. What needs to be explored is whether the existence of neurological scrub typhus with neurocysticercosis is the coincidental price paid for living in the tropics or there is something more to it as in case of Japanese encephalitis and neurocysticercosis co-infection. Pharyngeal-cervical-brachial (PCB) variant is a rare localized variant of Guillain–Barré syndrome that presents with a rapidly progressive oropharyngeal and cervicopharyngeal weakness associated with areflexia in the upper limb. Here, we are describing a case of a 20-year-old female who had a preceding history of fever with thrombocytopenia that was found to be dengue ELISA positive. This was followed by rapidly progressive weakness of cervical, bulbar, and bilateral facial muscles along with areflexia of upper limb. Nerve conduction study showed a reduced compound muscle action potential amplitude in the upper limb, and the CSF examination showed albuminocytological dissociation. The patient was given intravenous immunoglobulin, and she started improving within 3 days of commencing the treatment.